A new artwork which has been developed for SCAPE 8 New Intimacies. Fiona Jack, Ōtākaro Plant Parade, 2015. Commissioned by SCAPE Public Art. Image courtesy of the artist. Photo by Bridgit Anderson. 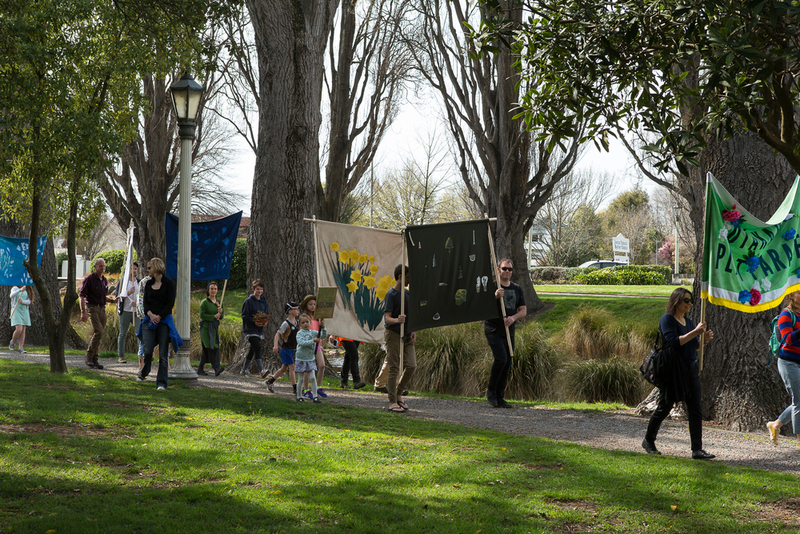 You are invited to join the Ōtākaro Plant Parade at 11am on Sunday 4th October, walking 1.1km along the banks of the Ōtākaro - Avon river from the corner of Kilmore & Madras to the Hereford Street Bridge. Ōtākaro Plant Parade is a new artwork by Fiona Jack which has been developed for SCAPE 8: New Intimacies. 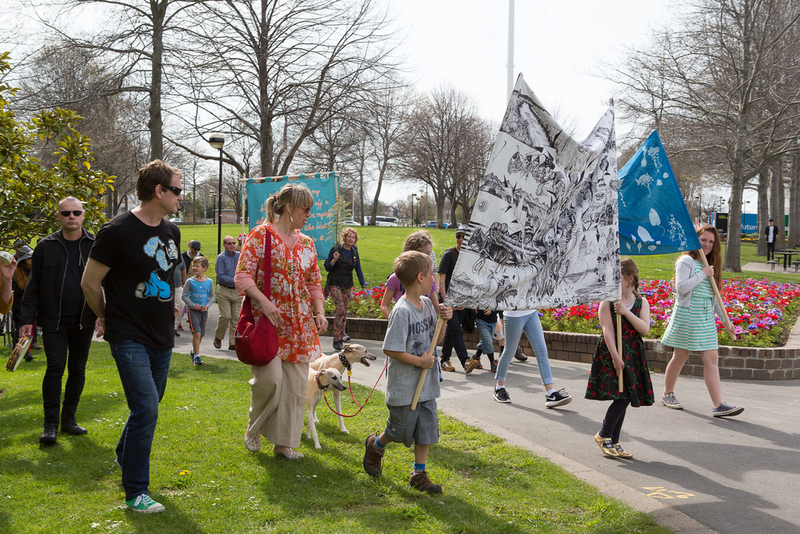 Over the past year Fiona has spent time in Christchurch talking with people and learning about ecological stories and histories of the Garden City. Along with some local collaborators, Fiona has handmade a number of banners that weave a web of connections across the flora and social groups of Christchurch, from the historic trees planted by Samuel Barker along Oxford Terrace, to the daffodils which appear every year through the efforts of the Christchurch Beautifying Association; from the Cabbage tree at Burnside High School to the self-seeding weeds that occupy the city’s vacant lots. 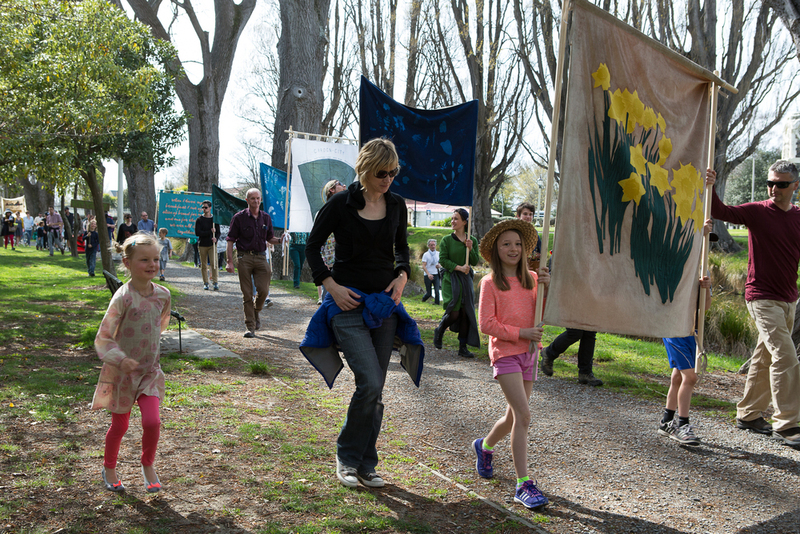 Individuals, families, members of societies and lovers of plants were invited to join the parade, to bring along their own banners, dress up, or take their pot plants for a walk. The documentation of this project is on display at the Ibis Hotel Christchurch. Fiona Jack; photo courtesy of the artist. Fiona Jack is a conceptual artist based in Auckland, New Zealand. Her projects consider socio-political issues and look to the past in order to understand the present. The collaborative project, Living Halls (2010), examined New Zealand’s radical commitment to building hundreds of social halls as war memorials after WWI. Also collaborative and focused on community The Heraldry of Presence (2014) studied banners and their long service as identifiers and gathering devices for groups of people. The series, In time I will see things a little differently (2010 - ongoing), engages with the close examination of historical photographs, and two projects with Ngarimu Blair and Ngāti Whātua o Ōrākei – Palisade (2008) and Kohimarama (2008) – have drawn attention to historical acts of violent colonisation through re-enactment and re-presentation. She has an MFA from CalArts Los Angeles and teaches at the Elam School of Fine Art at the University of Auckland.